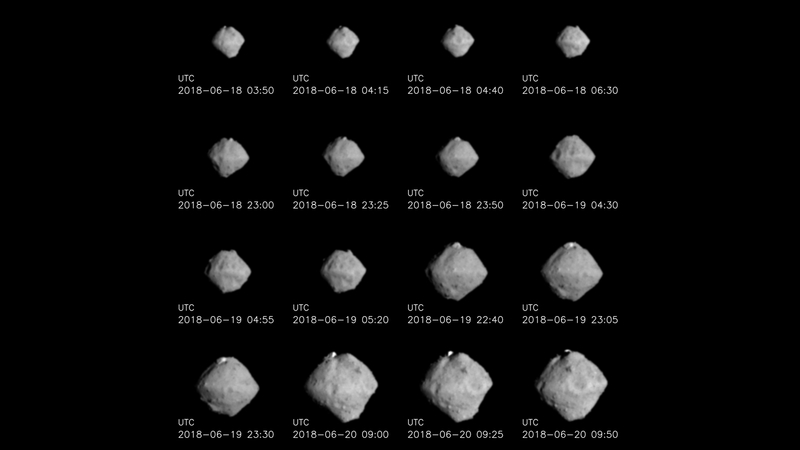 Images of the asteroid Ryugu acquired between 18 and 20 June 2018 by the Japanese Optical Navigation Camera – Telescopic (ONC-T) on board Hayabusa2, during the spacecraft’s approach. Among other things, a large rock with a diameter of approximately 150 metres can be seen protruding from the upper part of Ryugu. This is clearly visible because part of the surface is more reflective. This could indicate differences in the composition of the surface material. Credit: JAXA, University of Tokyo & collaborators. The orbit of asteroid Ryugu lies mostly between the orbits of Earth and Mars. Asteroid Ryugu imaged from a distance of 40 kilometres on 24 June 2018, during the approach of the Hayabusa2 spacecraft. The image was acquired by the ‘Optical Navigation Camera – Telescopic’ (ONC-T) on board Hayabusa2. The image shows a particularly large crater near the equator and the unusual angular shape of the asteroid. 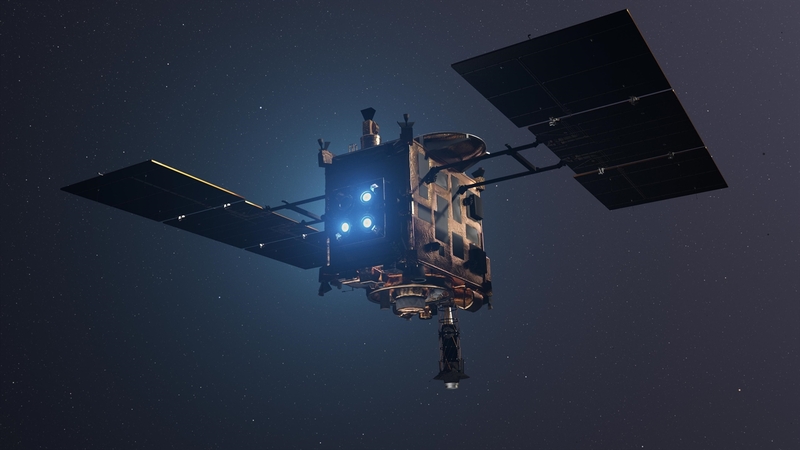 The Japanese Hayabusa2 spacecraft has made a 3200-million-kilometre journey with the German-French Mobile Asteroid Surface Scout (MASCOT) lander on board. 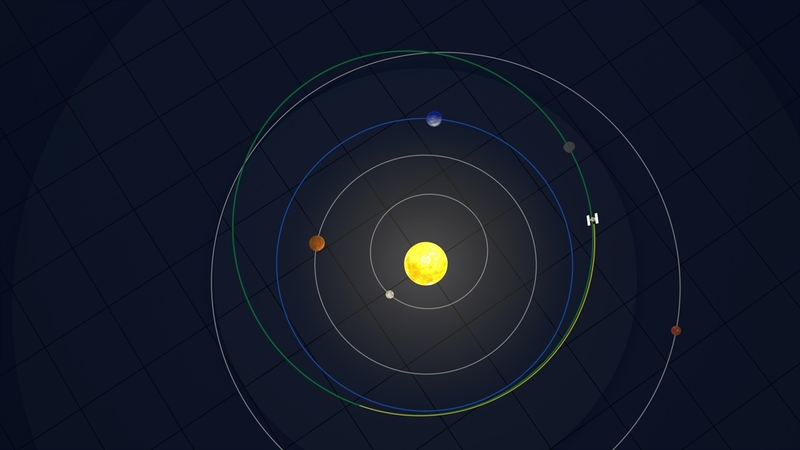 The two spacecraft have been travelling through the Solar System since December 2014, culminating in an approach manoeuvre to the near-Earth asteroid that has lasted several weeks and was completed on 27 June 2018. This was confirmed by the Japanese space agency (Japan Aerospace Exploration Agency; JAXA) today. Hayabusa2 is now flying alongside Ryugu at a distance of 20 kilometres, acquiring images and data while the celestial body rotates about its axis. MASCOT is scheduled to land on the asteroid in early October. In a world first, the lander will travel across the surface in a hopping motion, allowing it to conduct measurements at multiple locations. Researchers are hoping to get a better insight into the properties and structure of near-Earth asteroids in order to understand these very old remnants of the formation of the Solar System. This will offer insights into the formation of the planets and enable more effective planning of possible asteroid defence missions. It is also planned that the mother craft – Hayabusa2 – will return to Earth in 2020, bringing with it samples from the asteroid. 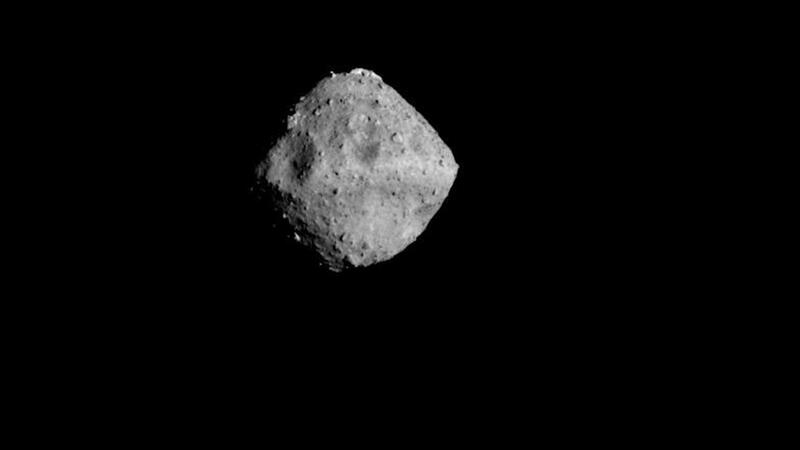 "As far as we are concerned, Ryugu is an ideal test object for us, as it is only 900 metres in diameter and there are many members of the same asteroid class in near Earth orbits," says Ralf Jaumann of the German Aerospace Center (Deutsches Zentrum für Luft- und Raumfahrt; DLR) Institute of Planetary Research in Berlin. "Its unusual, angular shape, revealed in the latest images, is exciting." In addition, craters and large boulders can be discerned on the surface. Tra-Mi Ho, the MASCOT Project Leader at the DLR Institute of Space Systems in Bremen, adds: "The scientifically surprising shape of Ryugu and its many craters will make the selection of a suitable landing site for MASCOT both fascinating and challenging." MASCOT will provide completely new insights into the material that made up the solar nebula, which has been resting on the surface of the asteroid for around 4.5 billion years. According to current plans, MASCOT will be released from its mother craft in early October and, upon landing, will 'hop' around on Ryugu, conducting measurements for at least 16 hours. MASCOT can hop up to a distance of 70 metres, allowing it to take measurements at several different locations on the asteroid – a first for international unmanned spaceflight. 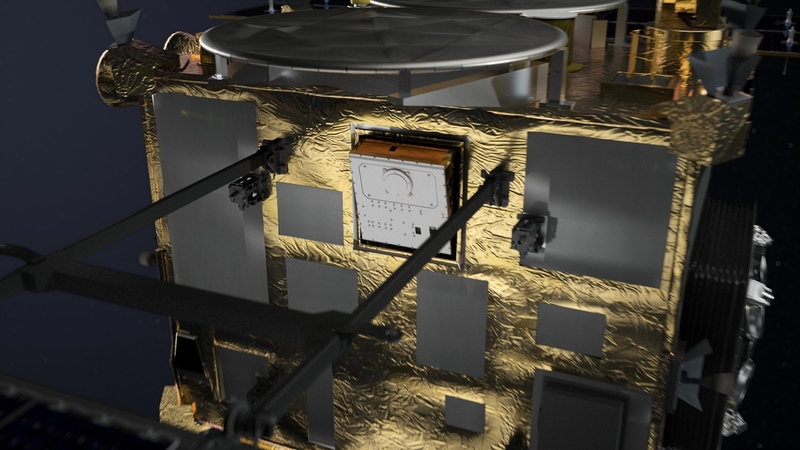 A total of four instruments are installed within the 30 × 30 × 20-centimetre lander. A DLR radiometer and camera, together with a spectrometer from the Institut d'Astrophysique Spatiale and a magnetometer from Technical University Braunschweig are set to examine the mineralogical composition and geological properties of the asteroid's surface and measure its surface temperature and magnetic field. MASCOT's swing arm will provide it with the kinetic energy required to perform its manoeuvres on the surface. The Ryugu asteroid and Hayabusa2 (Japanese for peregrine falcon) are currently around 280 million kilometres from Earth, so a signal from Earth takes approximately 15 minutes to reach the spacecraft. The latest images acquitted by the Japanese Optical Navigation Camera – Telescopic (ONC-T) show that Ryugu has a very unusual shape. Scientists do not expect the asteroid's gravitational forces to always be directed towards its centre. The asteroid's gravitational field is estimated to be approximately 60,000 times weaker than that of Earth. 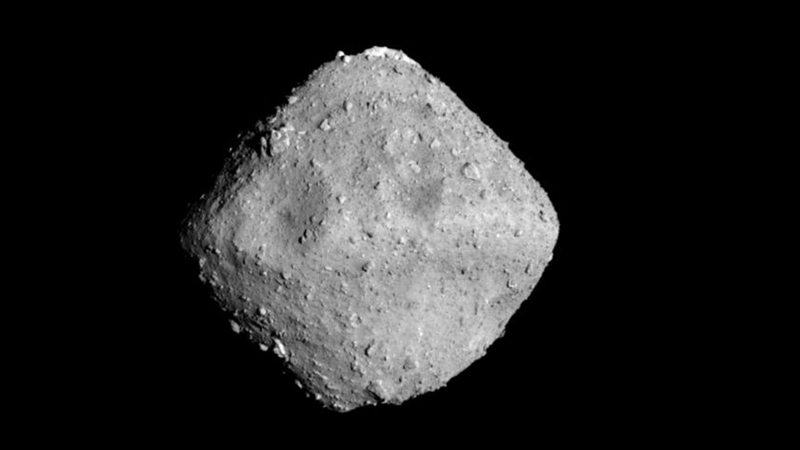 Ryugu, which is named after a submerged castle from Japanese mythology, rotates about an axis perpendicular to its orbital motion. Today, more than 750,000 asteroids are known. Only a small proportion of these – around 17,000 – travel on elliptical orbits that reach deep into the inner Solar System, crossing the orbits of Mars, Earth and even Mercury. Approximately 1000 of these are near-Earth asteroids with a diameter of more than one kilometre. On 3 December 2014 the Hayabusa2 mission launched from the Japanese Tanegashima Space Center with the German-French MASCOT lander on board, with the aim of obtaining new insights into the structure and composition of the primitive and carbon-rich asteroid Ryugu (162173), which crosses Earth's orbit. Scientifically, the focus is on discovering the role played by asteroids in the formation and early development of Earth and the terrestrial planets. One area of investigation is determining whether some of the water on Earth could have come from asteroids; another is examining the structural characteristics of a potentially threatening, Earth-crossing asteroid, with a view to developing defensive capabilities. At present, however, no asteroid is known to be on a collision course with Earth. Hayabusa2 will be observing Ryugu from close proximity for one-and-a-half years. 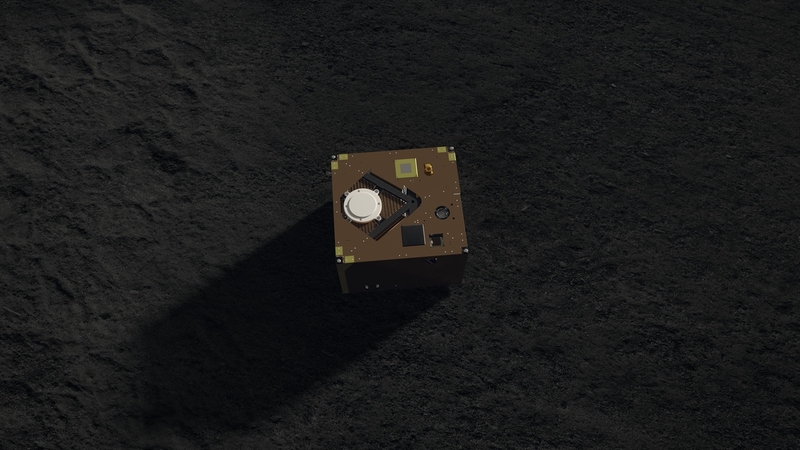 The highlights of the mission will be the landing of MASCOT and other microlanders, and the two or three samples acquired when Hayabusa2 descends to the asteroid surface. The samples will be returned to Earth on board Hayabusa2 in 2020. Hayabusa2 is a Japanese space agency (Japan Aerospace Exploration Agency; JAXA) mission to the near-Earth asteroid Ryugu. The German-French lander MASCOT on board Hayabusa2 was developed by the German Aerospace Center (Deutsches Zentrum für Luft- und Raumfahrt; DLR) and built in close cooperation with the French space agency (Centre National d'Etudes Spatiales; CNES). DLR, the Institut d'Astrophysique Spatiale and Technical University Braunschweig have contributed the scientific experiments on board MASCOT. Operation and control of the MASCOT lander and its experiments is carried out by DLR with the support of CNES and in constant interaction with JAXA. The DLR Institute of Space Systems in Bremen was responsible for developing and testing the MASCOT lander in cooperation with CNES. The DLR Institute of Composite Structures and Adaptive Systems in Braunschweig was responsible for the lander's stable mechanical structure. The DLR Robotics and Mechatronics Center developed the swing arm that will allow MASCOT to 'hop' across the asteroid. The DLR Institute of Planetary Research contributed the MasCam camera and the MARA radiometer. The asteroid lander is monitored and operated from the MASCOT control centre in the Microgravity User Support Center (MUSC) at the the DLR site in Cologne..
Click for more images here.